Are you on the hunt for decent riddles for high school students? Finding a good set of riddles teenaged students can be a hard to do, but our staff at Riddles and Answers made exactly that happen here. We used our resources to find some of the best high school riddles around, and we know that they will be a delight to use in your classrooms. These brain teasers are a joy to use at the beginning of the period or class, as they'll help to stimulate students mentally and also to motivate them before you must dive deep into the lesson. So feel free to solve, or use these excellent puzzles in your lessons. Please feel free to add educational riddles for high school students in the section that allows you to do so near the end of the page. Why did the girl need a ladder to go to school? This is the only country in the whole world that occupies an entire continent. What country is it? 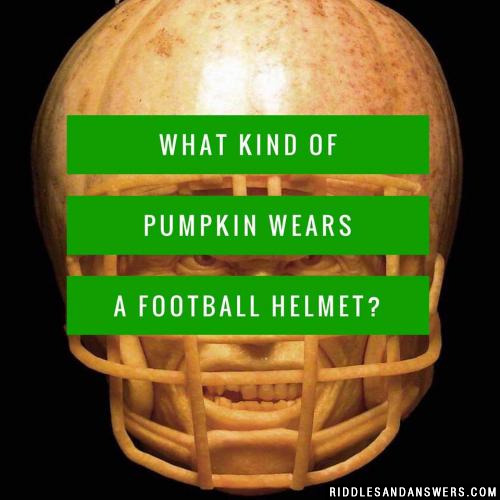 What kind of pumpkin wears a football helmet? I am the agreement that ended the French and Indian War and gave almost all of France's land in North America to England. What am I? Purchased from Russia in 1867, this state accounts for about 25% of oil produced in the US. It is also the largest state in the country. What state is it? Can you come up with a cool, funny or clever Riddles For High School Students of your own? Post it below (without the answer) to see if you can stump our users.